By embedding the original tinychat window within a larger page, I let users see what the pomodoro timer was up to as soon as they joined, and the page also doesn't let breaks run overtime because the timer just keeps ticking. Also, users could now show a persistent status of what they're working on. But there were issues with this. First of all, tinychat. This flash-based chatroom was a huge pain, with 20% of users reporting that they hated it with the fury of a thousand burning suns[source]. It didn't work at some offices, or on mobile, and it couldn't readily scale to more than 8-10 users. But even if we'd had the best embedded chat system ever, it still would have been an issue, because you'd still have to log into it again, after already loading the Complice room. And it would still not integrate with the rest of the page. gives new joiners an immediate sense of "there are people here"
if/when you finally do meet in person, you already recognize each other! And probably one or two others I haven't thought of. So we needed video. But video's a pain! After pulling my hair out trying to get it working this summer, I finally bit the bullet and just paid someone $500 to solve it. Which means that we now have fully-integrated webrtc video! It still has some bugs that I'm working with this other developer on fixing, but it's already about as reliable as tinychat, so I figured it made sense to just transition now. Among other things this allows is breakout rooms for if the main room gets too crowded (I expect this might happen in the days following this blog post, if not indefinitely hereafter due to increased awesomeness). Just add an extra "/something" to the url, where the something is any alphanumeric string, and then share that url with others in the crowded room. The timers will be sync'd, making it easy to switch between rooms. 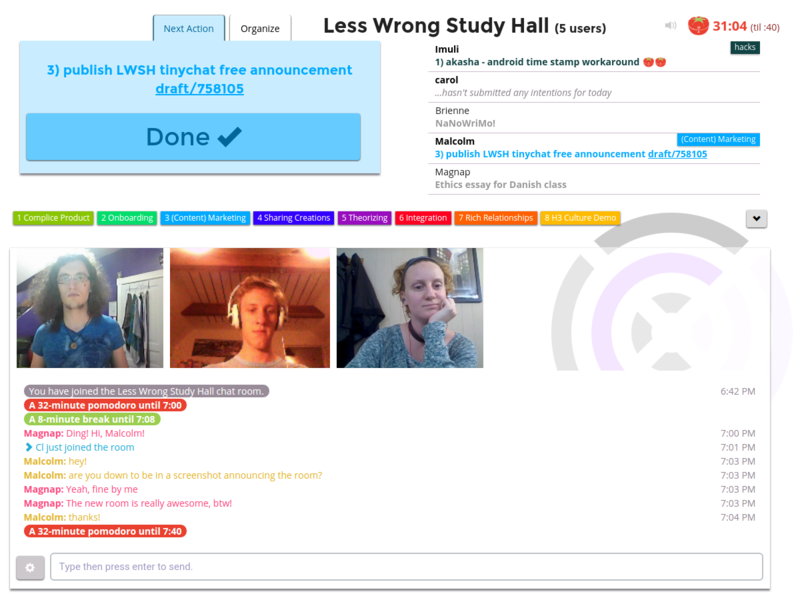 But also, now that we aren't using tinychat, it's trivial for anyone to make an alternate LW Study Hall that does 50-work/10-break pomodoros or whatever other timing you might want. To do that, go here (you need to be logged in to Complice). "Joining the Study Hall is probably the literal best thing that happened to me this decade. Thank you to the people who made this place exist."